The UNIVERGE SV8100 IP Communication Server is the ideal telephone system for small-to-medium size businesses that wish to compete and grow their business over time. It is part of our SV8000 series telephone system which starts with the SV8100 and scales up to the enterprise-ready SV8500. The SV8100 telephone system provides converged communications – data, multimedia and voice – over one network. There is no need to run two sets of cables for voice and data; one cable can do it all. Additionally, up to sixteen sites can be seamlessly linked together to share resources and features. This robust, feature-rich solution has the highest quality voice and reliability in the market and is completely scalable to meet an SMB’s communication needs now and in the future. telephone system rack stackable chasis. With a single voice and data networks, connecting more than one place of business, communication server functionality, improve coordination and communication of employees. Shared resources, operator services, advanced IP applications and voice mail. Connection with the NETLINK communication server provides automatic failover business continuity. The IP phone calls over an IP network with each other directly connected. Rather than through the traditional phone telephone switches. NEC's UC (Unified Communications) desktop suite is to provide a uniform application of communication, improve business productivity performance. 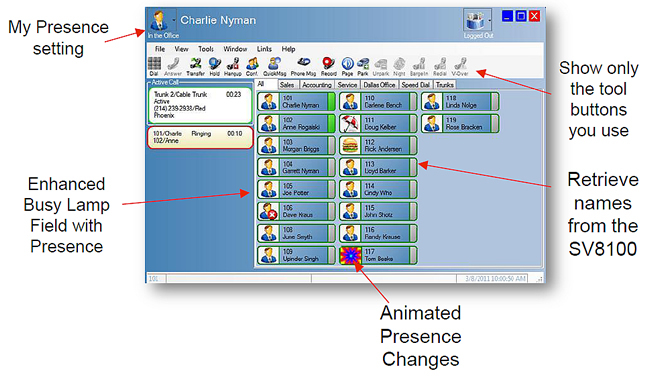 This is a scalable, feature-rich solution that simplifies the communication management. Designed for small to medium-sized enterprise development, UC desktop suite, users become more efficient.